Commercially available hearing aids are expensive. Here is a cheap hearing aid circuit that uses only four transistors and some passive components. In moving the power switch S to 'on' position, the condenser microphone detects the sound signal, which is amplified by transistor T1 and T2. Now the amplified signal through coupling capacitor C3 to the basic Transistor T3. 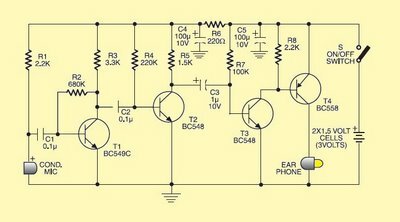 Signal further amplified by T4 to a PNP transistor drive low impedance earphones. Capacitors C4 and C5 is the power supply decoupling capacitor. This circuit can be easily installed in small, general purpose PCB or Vero board. It operates off of DC supply of 3V. For this, You can use two small 1.5V cells. Continue to switch S to the state 'off' when circuit is not used. To increase the sensitivity of the condenser microphone, the house in a small tube. This fee circuit around Rs 65.